Forward: elements of this letter have been expanded in other posts:- storm intensity not increasing shows how the Weather Story has metastasized through media, economic reports and policy statements, just like anti-vaccine junk science,- Toronto overland flow factors affect flood risk includes recommendations on urban flood hazard management, backed up by informative new overland flood risk mapping, that would complement policy solutions in this letter,- GO Train flooding not new per 1981 provincial inquiry highlights incorrect explanation of rail flood damages by climate change, explained decades ago to Premier Davis using hydrology (Don Watershed development) and hydraulics (Keating Channel dredging),- Connecting dots on climate change shows how infographics and anecdotes have replaced data and statistics in the myopic explanation of flooding that points to climate change, and ignores factors in the rainfall-runoff process (watershed development, stormwater management), and runoff conveyance (infrastructure design and operation) and ignores Environment Canada rain data. And here is the link to the Environment Canada report that was attached to the letter (Methodologies to Improve Rainfall Intensity-Duration-Frequency (IDF) Estimates: A Southern Ontario Pilot Study, Environment Canada Adaptation and Impacts Research Climate Research Division, December 2011). In response to our complaint to the CBC News Ombudsman, CBC has confirmed with Environment Canada that storm frequency is not increasing and has since updated their news item that misstated we are getting 20 times more storms now. I am writing to advise you of inaccurate statements made regarding extreme weather in Ministry of the Environment and Climate Change; Ontario’s Climate Change Discussion Paper 2015[i] (the Paper) and to advise that policy outcomes and actions will be misdirected if important causative factors in increased flood damages are not acknowledged or addressed. While I write this as a Professional Engineer (with twenty five years of experience in stormwater management, riverine and urban flood risk evaluation and mitigation, and analysis of weather statistics), the inaccuracies in the Paper are not nuances requiring technical expertise to recognize – rather, they are clear errors that I trust you can correct and act upon to more effectively address urban flood risks and damages. Your introduction to the discussion paper indicates that “Severe weather events are already driving up insurance costs and severely damaging our infrastructure” - this is a well-founded statement[ii]. Insurance losses due to flooding have increased, and several factors affecting losses are described later in this letter. i) The cited article is on temperature and precipitation prediction using global climate models (GCMs) and does not evaluate Ontario’s historical data. Based on these reasons it is inaccurate to claim increasingly severe weather is causing insurance losses. Page 19 in the Paper indicates “We are seeing … increasingly intense weather events such as ice-storms, rain storms..” but provides no reference document to demonstrate increasing intensities. The association of intense weather with ice storms in the paper is an erroneous association that links events that have indeed occurred and are top of mind (i.e., ice storms) with weather that has not had any documented increasing intensity trends. Scientifically, this association between documented events and undocumented events is no more valid than associating vaccines with increased autism. For reference, Environment Canada (EC) has completed an assessment of trends in historical rainfall intensities and found no significant change[v]. EC's Adaptation and Impacts Research Climate Research Division recently reviewed rainfall statistics and found significant increases, as well as decreases, were detected at some rainfall stations in a number of the extreme precipitation indicators. However, the majority of station trends were determined to be non-significant and no consistent geographical patterns for increases or decreases were observed across Canada. In most cases, the magnitude of the observed changes was also very small. This report is attached electronically for your reference. As an example of historical trends, yearly maximum observed rainfall depths observed over 5 minute to 24 hour durations that are readily available for EC’s long-running Bloor Street gauge are shown below[vi] - data trends show no increasing severity in rainfall intensities[vii] for any duration. 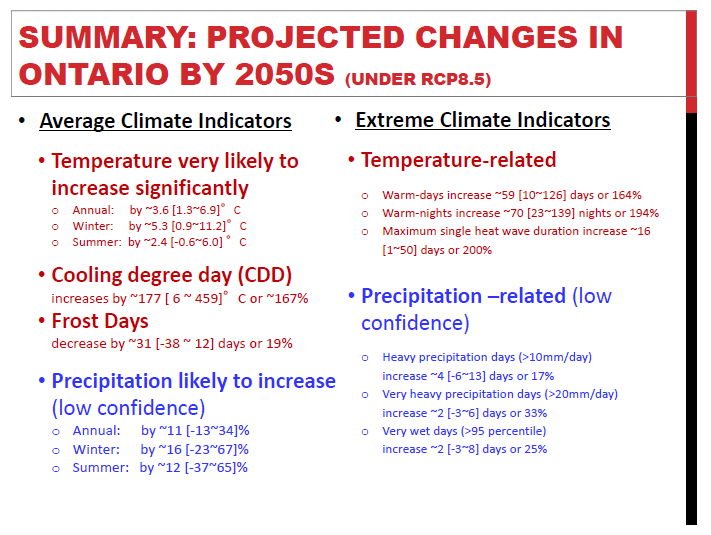 Unfortunately, your Ministry’s document Ontario’s Climate Change Discussion Paper 2015 also promotes statements on intense weather and historical trends that are not supported by the Paper’s references or research by others. Inaccurate statements on the cause of weather damages will lead to misdirected policies to mitigate the damages caused by severe weather. More accurate statements and effective policies require that ‘climate’ and ‘weather’ be distinguished in policy making. The Paper makes many statements about ‘weather’. However, the cited article provides no support for statements on ‘weather’ rain storms (temporal scales of minutes to days) and instead speaks to ‘climate’ (temporal scale of days to years). On precipitation, the research indicates ‘low confidence in predictions’, and does not assess intense weather events, as shown on excerpts from the Paper’s reference #24 on the next page. In fact, the Paper’s reference only assesses changes in low to moderate events (>20 mm/day) from an engineering design perspective, even though the events were deemed to be ‘very heavy’. To illustrate this, the previous Environment Canada data have an average daily maximum depth since 1940 of 45.9 mm[x], which is over 230% greater than the reference’s ‘very heavy’ rain threshold. Accordingly, intense events causing severe flooding and insurance damages are not characterized by the Paper – for comparison, the City of Toronto threshold for a 100 year storm[xi] is 85 mm, 425% greater than the ‘very heavy’ threshold in the Paper’s technical reference. ‘Very heavy’ precipitation threshold in Paper’s research (>20 mm/day) is ‘below average’ when compared to annual series of maximum daily rainfall from Environment Canada. This demonstrates the disconnect between ‘climate’ scale precipitation analysis and intense weather events. In brief, the Paper’s reference does not address predicted weather on the temporal scale that causes urban flooding, nor does it address severe weather characteristics – rather, it addresses climate and only low to moderate events. While you should discount anecdotes on weather (even mine), my professional experience with real-time rainfall intensity reporting and subsequent responses to flood service calls for constituents is that even isolated nuisance flooding begins at a precipitation thresholds well above that of the Paper’s reference of 20 mm, meaning it does not characterize storms causing urban flood damages. The Paper Introduction states that “..extreme weather is now part of the ‘new normal’.”. The statement is made in the context of observed temperature changes this century and creates and an erroneous association between average annual temperatures and short term weather patterns. The ‘new normal’ is a clever catchphrase but it is not supported by science as Environment Canada’s review noted above shows no trend in historical normal / average or extreme rainfall intensity statistics. It should be noted that when climate prediction models claim ‘new normals’ or increasing intensities, basic fact checking is often ignored. 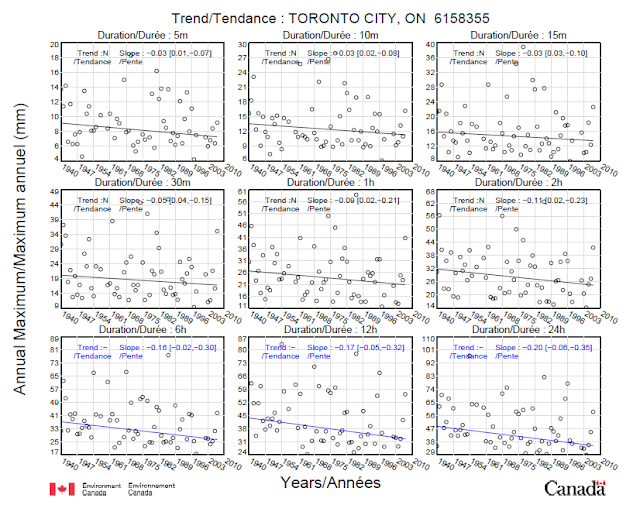 For example, SENES Consultants’ report[xii] for Toronto Environment Office in 2011 predicted doubling of 10 year return period maximum hourly intensities (from 20 mm/hr in 2000-2009 to 39 mm/hr by 2040-2049), but under reported today’s intensities by half in Table ES-3 of that report; today’s 10 year return period[xiii] maximum hourly intensity based on the Toronto Bloor Street, Ellesmere, and Pearson Airport rain gauges[xiv] is already 38.7 mm/hr which is already equal to the predicted future intensity – so the SENES report actually predicts no increase in rainfall intensities for moderately severe 10-year storms parameters, and the SENES characterization of the current moderate rainfall intensities is incorrect. Policy solution : require municipalities to mandate on-site stormwater source controls for infill development, regardless of size and type, i.e., include single family residential infill. To support this, continue to develop low impact development (LID) standards for ‘green infrastructure’, and require Environmental Compliance Approval (ECA) for source and conveyance controls to support their long term maintenance and effectiveness (this may involve collaboration with Ministry of Natural Resources and Forestry such that measures supporting their policies for flood risk reduction are incorporated under your Ministry’s ECA’s, typically issued only for end-of-pipe stormwater quality control measures). Policy solution: require municipalities to impose back-flow valves and sump pumps for infill development in areas with high extraneous flow, and ban basements in areas with highest extraneous flow to avoid increasing risk (e.g., no basements below ‘100 year storm hydraulic gradeline’ indicating potential sewer surcharge levels/risks). iii) plugging the relief overflows in sanitary systems (per Ontario's Policy F 5-5 that limits overflow volume to watercourses) has increased the potential for sewage back-up into basements instead of into watercourses. While this is an effective pollution protection strategy, it has increased flooding risks to communities. As examples Hamilton’s Sterling Street sewage overflow regulator weir[xv] was raised to reduce sewage spills even though there were basement flooding risks noted in the ‘pre-approved’ Municipal Class Environmental Assessment (MCEA) recommendation report; similarly the Kennilworth Avenue tank in Toronto, a storage facilities constructed to reduce Lake Ontario beach closing, was noted to be a cause of basement flooding during extreme events in the City’s “Area 32” basement flooding engineering study[xvi]. Policy solution: require greater emphasis on social and financial impacts due to flooding in MCEA’s. Allow sewerage overflows to watercourses in extreme events (e.g., no lower than 100 year events) as an interim measure to mitigate short term flood risks where a municipality has identified approved long-term plans to improve infrastructure to mitigate long term risks. Also, elevate the ‘Schedule’ of MCEA works that may affect basement flooding from pre-approved Schedule A, to Schedule B so that flooding impacts can be communicated to the public, including the insurance industry, and so that alternative works can be considered that will not increase basement flooding risk (e.g., Hamilton’s Sterling Street regulator weir changes were ‘pre-approved’ Schedule A works requiring no consultation). Policy solution: require municipalities to impose back-flow valves and sump pumps where basements are lowered or ban basement lowering in areas with highest extraneous flow to avoid increasing risks. Similarly, increase the safety factor against sewer surcharging in new subdivisions by increasing the design storm to 200 years from 100 years to check storm sewer design resiliency. This would be in the order of a 15-20% increase in design flow to check the resiliency of the new system design and can accommodate future uncertainty in weather conditions over the long life of the new infrastructure (over 80 years for storm sewers). Municipalities such as Ottawa have adopted such check storms for new subdivisions and this is a very cost effective adaptation strategy given uncertainty in weather predictions. Policy solution: education and awareness of private side risk mitigations measures such as lining or replacing private lateral drain connections, often blocked by roots that enter old clay tile pipe, or foundation drains. Policy solution: create/update Ontario Provincial Standard Specifications and/or Designs to require greater sewer by-pass capacity to mitigate flooding risk. vii) Keating Channel / Don River outlet dredging affects the frequency of Don Valley Parkway Flooding (“If you don’t dredge, it floods the Don River and the Don Roadway and the Don Valley Parkway,” explains Angus Armstrong, the harbour master[xviii]). Since the federal Fisheries Act became a criminal act in the mid-1990’s, maintenance of large and small drainage channels has been encumbered by environmental constraints on municipalities, e.g., to dredge or remove vegetation that reduced flood conveyance capacity. Similar to recent advances sewage overflow controls, this is an area where the balance between positive environmental protection and negative financial and social impacts due to flooding requires adjustment, given significant historical flood damages and risk. Policy solution: Require greater emphasis on public safety, technical effectiveness (level of service to protect against flooding) and financial benefits (deferred flood damages) as part of Environmental Assessments and Municipal Class Environmental Assessments. xiii) Basement flooding and insurance damages is correlated with ‘urban flooding’ beyond valley features, when the overland flow system concentrates runoff toward vulnerable buildings and infrastructure during severe weather (I have confirmed this using City of Toronto historical basement flood location maps for May 2000 and August 2005 storms and MNRF’s WRIP enhanced data sets). The overland flow system, unlike defined river valleys regulated by conservation authorities, is not always defined by municipalities as it is may be simply low-lying topography. The overland flow system is typically beyond the scale of conservation authority flood hazard mapping (traditionally mapped for drainage areas of ½ square mile or 125 hectares), meaning it is not mapped through engineering studies - what is not mapped cannot be managed. Property owners within these urban flooding risk zones cannot recognize nor mitigate their property risks and municipalities have no authority to regulate and manage risks. Policy solution: Fund and require conservation authorities to map urban flood risks by extending flood plain mapping through table land areas (beyond valleys) for smaller drainage areas than traditionally analyzed. Manage urban flood risk areas in the same manner as river flood plains, but perhaps using a two-zone concept where development is not precluded in shallow flooding areas and where flood proofing is completed. (Aside – urban flood risk mapping can be completed cost effectively using common analysis tools (US Army Corps’ HEC GeoRAS) and high resolution digital elevation models, based on my personal experience updating and extending conservation authority hazard mapping). None of the above factors affecting urban flooding can be addressed by climate change mitigation efforts, such as emissions reductions proposed in the Paper – they can be addressed instead by managing hydrologic impacts of development, managing hydraulics of infrastructure and drainage systems, setting broader environmental study goals, establishing more robust infrastructure design criteria, and adopting construction/operational practices that limit short term risks. Efforts put toward managing emissions will not address the root causes of increased insurance damages due to urban flooding. The Paper has conflated the well-documented climate/temperature trends that can be scientifically linked to emissions, with the non-documented weather/intense rain trends that have not been observed or documented by any credible source. While some may cite a high number of severe storms and flooding in the former North York area of Toronto as evidence of significant weather trends, this observation is one anecdote. Since it is not supported by Environment Canada’s data, it is at best a convenient explanation for recurring flooding in an under-designed, ‘overland relief flow challenged’ drainage system that has been under study since the late 1980’s (e.g., during my first summer job in engineering consulting). There may be other anecdotes on severe weather, but the plural of anecdote is not data, nor is it evidence that could be used to inform very important public policy. The Paper has also erroneously associated observed events (ice storms and temperature changes) with non-documented events (precipitation and severe weather trends). Key statements related to trends in historical precipitation are not supported by the Paper’s references. In fact, no analysis of historical precipitation is included at all, and no prediction of weather on the appropriate temporal scale to relate to flood is included. By relying on errors, tangible and measurable flood risk factors and mitigation approaches have been grossly overlooked, and proposed mitigation policies related to emissions have been proposed that will not address the root causes of increased insurance costs due to flood damages. I trust that you can correct the inaccurate statements in the Paper and will identify and pursue policies that can effectively address the flood risks damages due to severe weather. This will require collaboration with other Ministries (Natural Resources and Forestry (MNRF), Municipal Affairs and Housing (MMAH)) that have a key role in flood risk management in Ontario, and municipalities who implement and maintain flood remediation infrastructure. Essentially, ownership and leadership on Provincial Policy for management of natural hazards must be established in the appropriate Ministry/Ministries, and resources must be assigned to advance appropriate, mitigative, evidence-based policies for managing urban flooding. Traditionally, MNRF and MMAH are engaged only on riverine flooding issues (i.e., in valleys), and MNRF’s limited resources are currently focused on natural heritage issues (e.g., Endangered Species Act and regulations) - accordingly risks to the well-being of small, endangered aquatic organisms like Redside Dace are addressed with focused attention, but risks to the economic well-being of Ontario cities due to urban flooding are not. Based on its results-based plan[xix] with priorities and key measures that relate to infrastructure revitalization and economic prosperity, it may be most appropriate for the Ministry of Economic Development, Employment and Infrastructure to develop policies related to urban flood risk mitigation. Please feel free to contact me if you require any clarification on the content in this letter and to respond. P.S. – Your leader has acknowledged recently that the Ontario government has to “test our assumptions” in relation to major game-changing initiatives. Please do so on the topic of extreme weather, urban flooding and climate change. Robert Muir is a Professional Engineer who currently manages the long-term flood control program for a GTA municipality. He has 20 years’ prior experience in engineering consulting where, as a partner with his firm, he managed the national water resources engineering practice. He has extensive experience in the statistical analysis of meteorological, hydrologic and urban drainage data for the purpose of flood risk management, infrastructure planning and remediation, and litigation. Robert was a contributor to the Institute for Catastrophic Loss Reduction’s Cities adapt to extreme rainfall, Celebrating local leadership (2014) [xxi] , a reviewer of their Best practices guide: Management of inflow and infiltration in new urban developments (2015)[xxii], and was the Consulting Engineers of Ontario’s representative on the Ontario Provincial Standards Drainage Committee. He has developed and applied design tools for the low impact development measures using analytical probabilistic rainfall / runoff models. 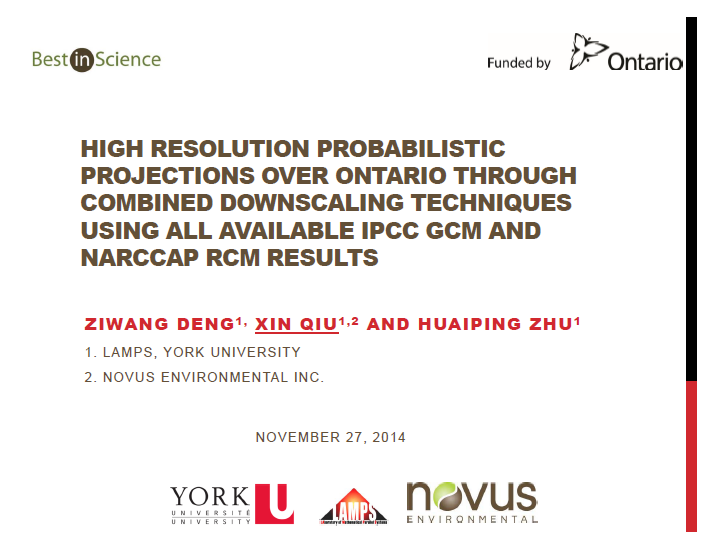 In his spare time, he has developed urban overland flow risk models to investigate correlations between Toronto’s widespread 2000, 2005 and 2013 basement flood incidents and neighbourhood scale topographic factors that can characterize flood vulnerabilities and guide prioritization of remediation efforts. Through his studies and research at the University of Toronto, Department of Civil Engineering, he was the recipient of NSERC grants and the W.S. Wilson Medal. He values evidence-based policies and decision making. [xvii] As reported in http://www.torontosun.com/2012/06/06/open-sewer-caused-union-station-flood : “The city is having the TTC’s contractor reconstruct a large sewer as part of the Union Station Revitalization project. Crews had pulled out a section of the existing sewer and put pumps in place to pump the sewage across during the installation of maintenance holes. The flood started with a brief but intense rainfall that “sent a rapid surge of storm water flowing through the city’s sewer collection system and wastewater treatment plants.” During Friday’s storm, “sanitary and storm water overflowed from the open section of the sewer” and flooded out into Union Station. “The contractor and the project management team are working to put in place measures to avoid a recurrence during construction,” the city stated in a press release. Flood is the new fire. Blue is the new red ink, as water damage claims increase. Enough slogans though ... time for insights resulting from new overland risk mapping for the GTA! Overland flooding had recently becoming an insured peril for residential property owners, offered by Aviva Canada. Others are following suit. So now is the perfect time to explore the differences in "surface flooding" types in an urban environment, to assess risk factors and even look for correlations with traditional insured perils, like sewer back-ups that cause basement flooding. Understanding risk factors can support better decisions and help direct mitigation efforts. First some set-up and definitions. Media often reports the devastating flooding in Alberta and Toronto in 2013 in the same breath, but there are important distinctions to be made - High River's "riverine flooding" along the low-lying bottom of a defined valley or wide flood plain is quite different than "urban flooding" high up on the table land (i.e., many thousands of Toronto's flooded homes). To put things in perspective, the Toronto's Don River has a drainage area of 360 sq.km contributing to valley flow, while a table land area subject to urban flooding may have as little as a 0.01 sq.km, or 10 hectare drainage area. Riverine flooding is largely manageable - spatially fixed, quantifiable in terms of flow frequency and flood depth, and (in Ontario) regulated through the provincial policy statement on natural hazards, MNR guidelines, and conservation authority regulations. In the past, flood plain mapping to define riverine flood risks was once the 'bread and butter' of engineering consultants, who started number-crunching U.S. Army Corps of Engineer's HEC-2 simulation models back using punch cards - yes, that long ago. The limitation is that only a few percent of Ontarians live in flood plains according to Conservation Ontario. And based on new analysis from cityfloodmap.com, only about 2% of May 12, 2000, August 19, 2005, and July 8, 2013 Toronto flooding occurred in river flood vulnerable areas! Urban flooding, in contrast, affects a greater proportion of the population - 86% of Ontarians live in urban areas per the 2011 census - but this type of flooding is not as readily managed. In fact, risk factors equivalent to flood plain maps are seldom ever mapped. This is because urban flooding is transient and overland flow paths are not permanent physical features that are part of i) a defined valley, or ii) municipal drainage infrastructure. Overland flow paths appear for a few minutes or hours every few decades and then subside. So calling this 'flash flooding' is appropriate - engineering studies show severe urban flooding events are most highly correlated with high short-term rainfall intensities over minutes. Hours later, the overland flow is gone. To prevent urban flooding, engineers have been designing the overland drainage network though subdivision grading since the early 1980's when "dual drainage design" emerged in Ontario. This approach recognized the limited capacity of the minor system (underground sewer system) for conveniently conveying small storm runoff, and the need to design the major system (above-ground overland system) for extreme storms. In pre-1980 development, the major system still exists but it can run haphazardly beyond roads, through back yards, between houses and into basement windows and walkouts. And this critical, non-designed, transient overland flood risk has not ever been mapped - ta da! - until now. New analysis from cityfloodmap.com in the slides below ties overland flood risks all together, reviewing flood incidents across regulated valley hazard areas and river flood vulnerable areas (riverine flooding), and within overland flow risk areas across Toronto table lands (urban flooding). It provides insight into risk factors affecting overland flooding and direction on de-risk opportunities. Most importantly, it demonstrates the correlation between traditional sewer back-up peril and the emerging overland peril, which should cause some insurance providers to evaluate portfolio risk (where should coverage be coupled or excluded in isolation, recognizing the correlations). If flood is the new fire for the insurance industry, this new analysis, which demonstrates neighbourhood scale flood risk factors due to overland and catchment slope risks, should also prompt discussion on how flood risks are assessed, priced and prioritized for mitigation, adaptation and insurance purposes. Just as fire underwriters identify neighbourhood scale risk factors and consider fire suppression capabilities of municipalities, flood risk assessors should consider the overland risk factors, that extend well beyond the extent of individual properties. Determining risks should not only consider whether an individual property has a reverse slope driveway when broader overland flood risk factors can be readily quantified.